In 2015, Ahmad Al Zoubi fled from his Syrian homeland. Today he studies mechanical engineering in Germany. Like other refugees now at a German university, he was helped into higher education by the Integra language programme. The attacks on Daraa in southwestern Syria destroyed the lives of 19-year-old Ahmad Al Zoubi and his family. He had finished school, qualified for university and been accepted to study mechanical engineering in Damascus. But how could anyone think of studying in Damascus in autumn 2015? Ahmad and his family take flight and end up in Bremen. The first six months are spent at a refugee accommodation centre. Ahmad attends the German courses run for incoming refugees – but his sights are set higher: he wants to study in Germany. He makes enquiries everywhere, until one day he hears about the Integra language programme. Specifically designed to promote the integration of refugees in higher education, it was launched in 2015 by the Federal Ministry of Education and Research (BMBF) and the German Academic Exchange Service (DAAD) (see info box). The programme helps refugees who wish to study in Germany to settle into higher education as quickly and easily as possible. In most federal states, they are allowed to start university as soon as the asylum process is underway, so they can also join the Integra programme at an early stage. To be eligible, they need to show that they have refugee status and university entrance qualifications, i.e. an appropriate educational background. At the heart of the Integra programme is an intensive language course, which Ahmad attends at the Goethe-Institut in Bremen. “That course took us to a very high level in preparation for studying in Germany,” Ahmad explains. “I started it with an intermediate B1 certificate and Integra took me to C1 exam level”. The C1 certificate is an adult qualification attesting to a high level of proficiency in the German language. It is required by non-nationals seeking a career in medicine, for example, or applying for university in Germany. The Integra course helped Ahmad reach C1 level. For the 20018/19 winter semester, the now 21-year-old received acceptances from three universities to study mechanical engineering and he chose Bremen. Later, he would like to work in the field of renewable energy. But he does not want to give up his second great passion – film-making. His documentary “Flucht aus Syrien” – “Escape from Syria” – a compilation of mobile phone footage taken while he was on the run, has already been shown at a number of cinemas and universities. Audiences and critics both loved it. Ahmad advises young refugees who would like to study in Germany to be proactive: “Go to the university and make direct enquiries. Don't ask your friends, find out for yourselves what opportunities there are.” The only thing the young Syrian regrets is that the Integra programme is not available in every federal state. Integrating refugees in higher education is a major challenge for German universities. In view of the large numbers of refugees registered in Germany at the end of 2015, the Federal Ministry of Education and Research (BMBF) and the German Academic Exchange Service (DAAD) launched “Integra – Integration of Refugees in Higher Education”, a programme now offered at around 200 German universities and other institutes of higher education. In conjunction with intercultural workshops and propaedeutic lectures, the intensive language programme is designed to help eligible refugees get into higher education as early as possible. Bremen universities have taken part in the Integra programme since April 2016 and receive additional support from the state authorities to do so. 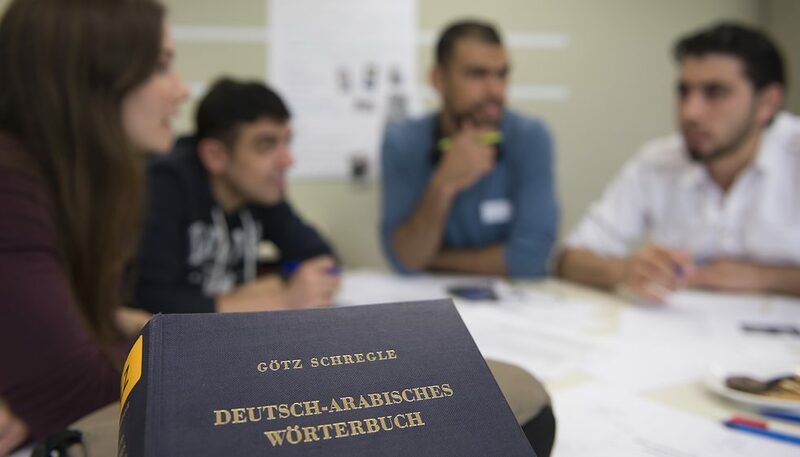 “HERE Studies” (Higher Education Refugees Entrance Studies) is a joint project by the Foreign Language Centre of Bremen Universities, the dedicated HERE Office and the Bremen Goethe-Institut. The latter offers language courses for refugees up to C1 level, prepares them for university entrance language exams and runs the exams itself. The Foreign Language Centre of Bremen Universities supplements the intensive language tuition with tutoring. The success of the programme will be analysed in a research project. Dr Claudia Harsch, research director and general manager of the Foreign Language Centre of Bremen Universities and professor of language teaching and learning research, will monitor the linguistic development and integration of refugees during the Integra programme and the first phase of their university studies. In interviews and questionnaires, the first-year refugee students will be asked to assess in retrospect how well the programme prepared them for university. In the support programme’s first year, more than 6,800 refugees attended some 700 Integra language and subject-specific courses designed to prepare them for higher education. In 2017, the number of participants exceeded 10,000. Petra Schönhöfer is a freelance journalist and author. Copyright: Text: Goethe-Institut, Petra Schönhöfer. This work is licensed under a Creative Commons Attribution – Share Alike 3.0 Germany license.